This instalment of Schubert from Leipzig emphasises the composer's melodic side. Soloists, choir and orchestra all make a real effort to highlight the linearity of the music, and the shape of each phrase is finely sculpted to maximise the song-like lyricism. That isn't the only way to approach Schubert's masses, of course, and there is a lot that is lost in the process. Both the choir and the orchestra here are relatively small, and there are moments where the score relies on a sense of drama and atmosphere that is often lacking. The Sanctus is a case in point, it is a movement that can really pack an emotional punch with larger forces and more contrasting dynamics. Instead we are presented with another chamber-like movement in which the melodic lines and counterpoint are expected to carry the music, which they do to a certain extent, but not enough to make up for lack of drama. Which raises the question of what sort of forces Schubert would have expected for the work. With that in mind, it is worth pointing out that the Leipzig Kammerorchester are a modern instrument ensemble, so we are also deprived of the heightened timbral contrasts that period instruments could bring, and that could better justify the smaller ensemble. Technically, both the choir and the orchestra put in near note-perfect performances, and although there is nothing exceptional about the interpretation, it is to all the performers' credit that they can maintain a unified interpretive approach throughout. The sudden moves between tempos and moods are also impressively handled, although whether through the astuteness of the players or through edits between takes is difficult to say. The solo quartet is made up of young singers, all of whom are clearly more than capable in this repertoire. Generally speaking, Schubert treats them as a single unit, so the opportunities for individuals to shine is limited. That said, the finest of them is definitely the alto Bettina Ranch. She has a warm richness to her voice that you could almost mistake for a tenor, apart from the fact that she can take it right into the upper register. The sound quality is fair but not exceptional. There is little definition to the orchestral or choral sound, and the soloists all sound distant. However, the balance is finely judged, and there are never any worries about the orchestra overpowering the choir. 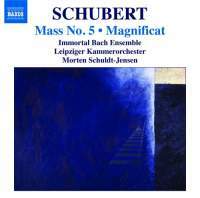 The disc ends with Schubert's rarely heard Magnificat D486, which presents the composer in a more Classical mood. It is a bright, upbeat piece, but there is little here of his harmonic innovation, or indeed anything that would distinguish him from his Viennese contemporaries, bar the sheer quality of the writing. It suits these performers well, another chance to show off their tight ensemble and ability to move instantly between different moods. Recordings of Schubert's masses come in a variety of flavours these days, and in the grand scheme of things, this one sits squarely in the middle. It is neither a historical performance nor a grand Romantic edifice. Rather it is a modern reading, a coherent interpretation competently realised by a proficient group of musicians. It won't tell you anything new about Schubert, but it's still worth a listen.